So... get this. Before Summer 2016 (that's the summer right after I graduated college)- I had never been to a baseball game before! Isn't that insane?! I grew up in Maine, and we have a very popular minor league team there called the Portland Seadogs. I grew up figure skating, and my ice rink in Portland was actually next-door to the stadium that the Seadogs played at in the summer! But despite that, I never made it to a game. A lot of people in Maine are also huge Boston Red Sox fans, but similarly with the Seadogs, I didn't have any huge Boston sports fans that were a big part of my life, so it wasn't something I grew up loving. The college that I transferred to in Charlotte and ended up graduating from didn't have baseball as a sport, so I didn't have an option to go to college baseball games either. To be honest- I never really thought much about baseball at all until I finally made it to a game! WELL - my chance to go to a baseball game finally came two summers ago! Charlotte's minor league team, the Knights, have a fairly new stadium right in the heart of Uptown. I went to a game with my roommate at the time, Ciera, and her family. I also went to a Greensboro Grasshoppers game that summer with Cara from Caralina Style. Baseball games are so much fun- especially minor league ones I think!! It's an excuse to enjoy a beer or other cold beverage, treat yourself to tasty ballpark food, and enjoy a warm spring or summer evening outside with friends. Some nights at the ballpark are themed as well and there are giveaways- I won a free t-shirt at the game I went to with Cara that I still wear frequently to the gym. To be honest, I still don't completely understand all of the rules of baseball, but it's also not the hardest sport to follow along with either! The best part of all is that minor league games are pretty cheap to get tickets to, so it's an affordable way to have a fun evening. Vermont had its own minor league team, and I'm still a little bummed I never made it to a game while I lived there. Ah well! Anyways, if I get the chance to go to any baseball games in Virginia this season, I feel like I'll wear this outfit or one very similar!! 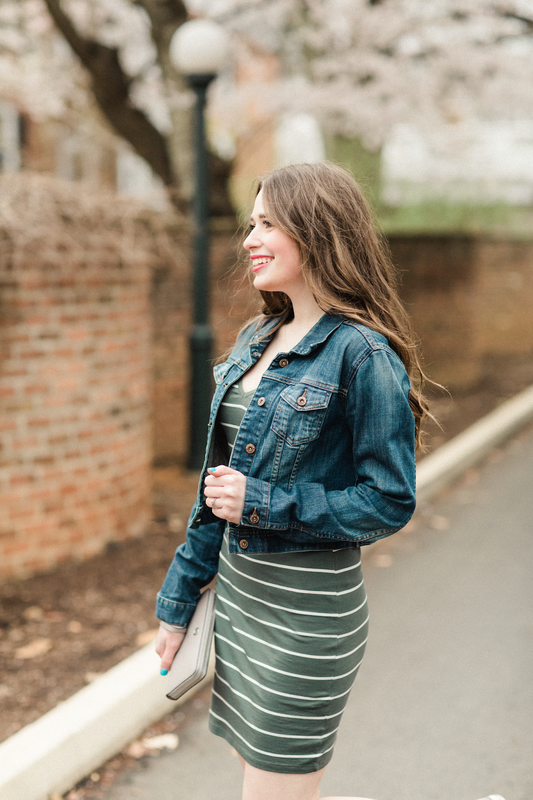 A casual fitted dress paired with a jean jacket and Converse seems like the ideal outfit for a summer sporting event. You'll look and feel cute, but will still be comfortable and not be overdressed! My dress is actually a clearance rack find from a few months ago (it was only $10!). The good thing about striped dresses the one I'm wearing is it wouldn't be hard to find one like this from another retailer - this one is similar!! I'm really excited about tomorrow's blog post. Grocery Month will be starting on the blog! I first got the idea to do this on Instagram, after I posted a Story about something to do with grocery shopping several weeks ago, and my DMs blew up after! Clearly a lot of y'all enjoy grocery shopping and talking groceries as much as I do, so I got the idea to do Grocery Month for May. In these blog posts I'll be visiting all of the grocery store chains that Charlottesville has, and reviewing them! Which meet my personal grocery shopping needs best (as a single female who lives alone), which have the best selections of products, which are most affordable, etc. I've never done a blog post series like this before, so I'm not really sure where it will go, but I sure am excited! Shop Your Closet for Wedding Season: Part 3 - Weddings. If you have a wedding (or lots of weddings!) coming up this season, you don't have to break the bank to find a new outfit for each one. Chances are you probably have wedding-ready dresses hanging in your closet already- I definitely do! 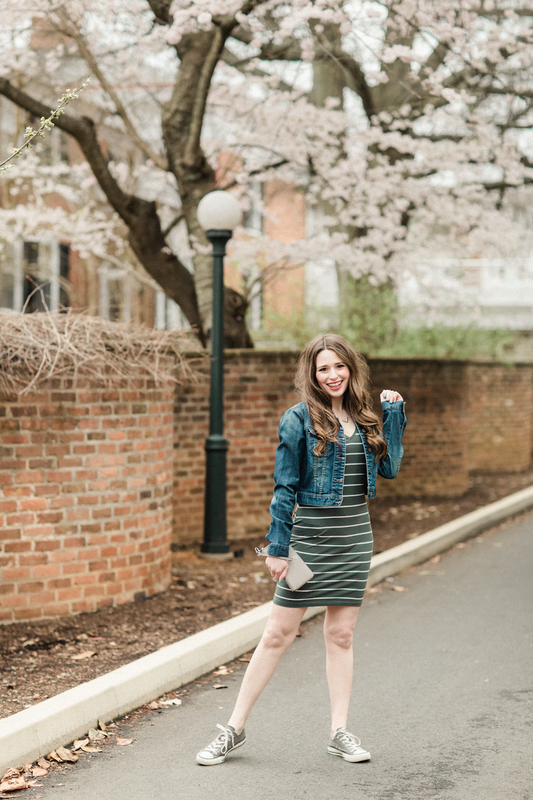 I've already shared on the blog how to shop your own closet for bachelorette festivities, bridal showers and rehearsal dinners, which are important pre-wedding events. 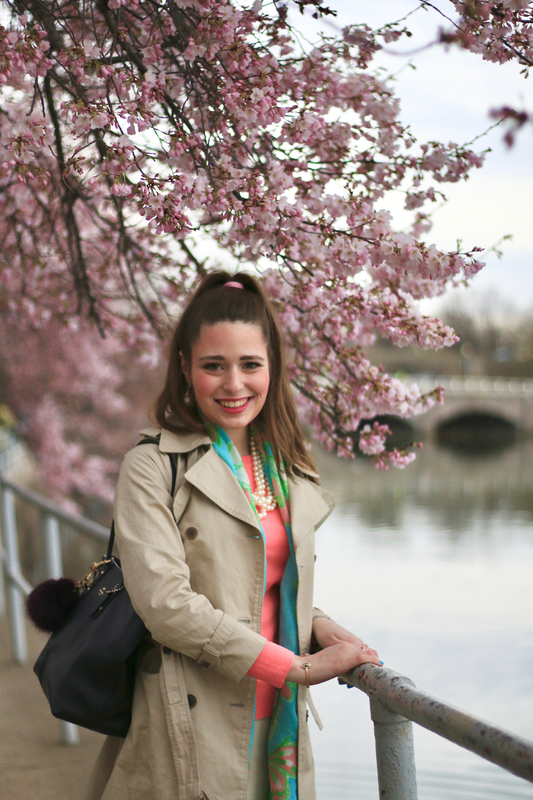 Today's post will share style inspiration straight from my closet if you're a guest for the main event! One last wedding fashion tip! Check with the bride or someone in the bridal party to see what color(s) the bridesmaids dresses are- in addition to not wearing white (#duh), I'd recommend not wearing a dress that looks super similar to what the bridal party is wearing either. 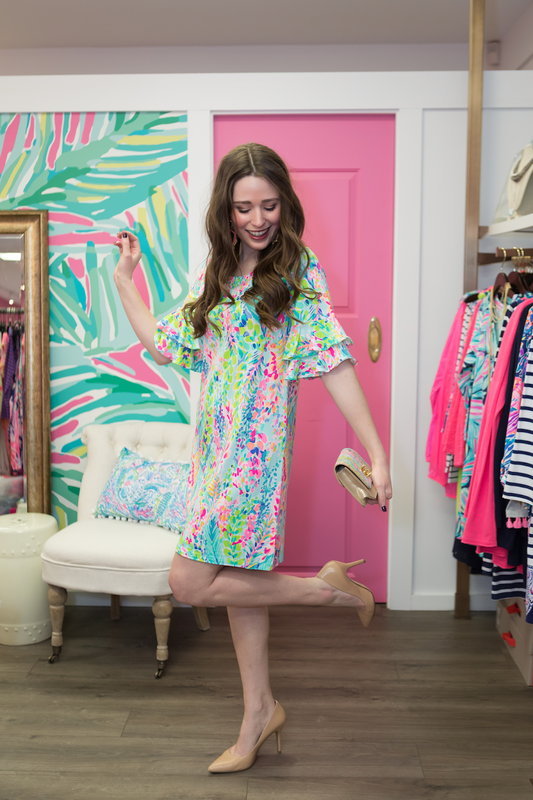 As much as I love Lilly Pulitzer, I find a lot of their classic shift dresses to be a bit casual for weddings, and more suited for other wedding festivities such as bridal showers. However, some of Lilly's dress styles are made of different fabrics and are more formal in nature, making them perfect for weddings! I modeled this gold beauty during a collaboration last winter with Pink Colony in Stowe, Vermont. The dress is now out of stock, but this Lilly dress is very formal and would be perfect to wear to a wedding! All weddings have different dress codes, depending on the venue, general ambiance, and time of year and day. Sometimes morning or early afternoon weddings can have a dressy-casual or semi-formal dress code. I think a lace midi dress like this would be a perfect for a daytime wedding, especially one outdoors in the spring! My exact dress is still in stock here, and it's also available at another retailer in more pretty colors! Midi dresses are just good choices in general for weddings- they're a little bit classier than short dresses. My mom has always told me that green is one of the best colors on me, so I've kept this green pleated midi dress in my closet for a couple years now for formal events as needed! It's no longer in stock, but this dress is similar. I might actually wear this exact dress for the wedding I have to go to this summer! Dresses of light, flowing material are ideal for summer weddings, and they won't hinder you from hitting the dance floor. I love the colors in this dress as well. Do you have a lot of weddings to attend this year? I have just one on the calendar for this summer, but I feel like a lot of my close friends are *just about* to be engaged.... like wedding-mania will be COMING for me in 2020 and 2021, haha! Sightseeing weekend: My mom arrived in Virginia on Friday night to visit me! We had a very busy weekend of sightseeing and running errands for my apartment. We spent Saturday in Richmond, and I fell in love with that city!! Some of the neighborhoods reminded me so much of Charlotte. I can't wait to go back. On Sunday afternoon we visited Monticello in Charlottesville, which is Thomas Jefferson's home. I had to work for the earlier part of Saturday and very early Saturday morning all of my DMV stuff was finally resolved (!! ), so it was a really busy weekend! Jane the Virgin season finale: This aired on Friday night while I was getting my mom at the airport, so I didn't catch up until Sunday evening. OH MY GOODNESS. Do any of you also watch Jane? I continue to fall more in love with this show with each season.... and THIS SEASON FINALE. AHHHHHH. How are they going to leave me waiting on that cliffhanger until the fall?! Oh my gosh. (If you also watch you know what I'm talking about!) If you don't watch Jane- the first few seasons are on Netflix and I highly recommend it, although I didn't really love the show until the end of the first season. Anyways, this Buzzfeed article has some crazy theories about the finale and I found it so interesting! Where am I from? So this is kind of random... but since moving to Virginia I have had a hard time telling people where I am from when they ask. Usually I end up telling people a short version of my whole life story about being from Maine, living in NC for five years for college and one year post-grad, moving to Vermont for my first job, and now being here, but it always seems like such a long answer. Maine is my actual home state (my parents still live there too) but I haven't actually lived there as a resident in years now. I consider NC to be my adopted home, and it's the state where I have the most friends/important people in my life. Vermont is not a place that I'll ever consider my home- but the facts stand that it's where I just moved from! So- my question to you is how would YOU answer the question if you were me, and someone asked "Where are you from?" Should I just continue to list all three states? Haha! One stop that my mom and I made while in Richmond this weekend was to my very favorite store ever, At Home! I hadn't been to an At Home since I lived in Charlotte and I missed it so much. We bought some new wall art for my apartment, and a couple other things I needed as well. I'm really enjoying settling into my new place in Charlottesville! I keep seriously crushing on dress shorts for spring! This pair is very affordable and comes in such a pretty color. How beautiful are the Gal Meets Glam dresses in Julia's new collection? It was so fun to see all of the designs when they launched last week. I haven't purchased any myself (yet! ), but I think this style is my favorite!! Everything about this dress screams "Annaliese" - I would love to wear this for work all spring long! I love the look of brightly colored heels for summer- these come in a few colors and all of them are just gorgeous. How cute and preppy are these Lilly Pulitzer inspired sandals? They're also the bargain of the week at just $25- such a steal! Recipe of the week: Potsticker Stir-Fry from Woman's Day magazine. This recipe was so easy to make, and tasty too! I'm trying to cook more weeknight dinners that include more vegetables, and this stir fry was a yummy way to do that. I used pork instead of vegetable potstickers, but you could easily make this a vegetarian recipe by using veggie potstickers. Song of the week: No Tears Left to Cry by Ariana Grande. Ariana is BACK y'all, and sounding amazing!! I have had her new song on repeat constantly since it dropped on Friday- I am obsessed. This song coming out was actually the first time since I started my new job that I've been sad that I don't work in CHR (Top 40) radio anymore, because sadly this song isn't country so I'll never get to play it on my new station, haha! The music video is great as well. Enjoy the rest of your week! Thank you so much for reading! Guide to Moving Out of State: Part 3 - Expenses to Prepare For + Q&A. We've made it to the end of the moving process! Both literally and figuratively. 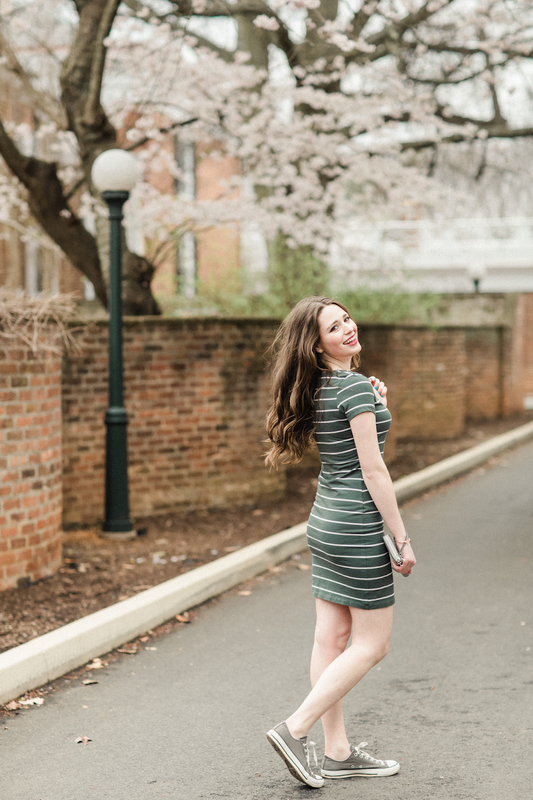 Literally as in I've been in Virginia for over a month now and am really starting to feel settled here, and figuratively in that this is the final post in my moving out of state blog post series! I wasn't honestly quite sure at first how where to go with this third post: in my first post I wrote out a pre-move checklist, and the second post covered packing in detail. So where to go next? I thought about it a lot, and one thing I realized that I felt a little overwhelmed by with both moves this year and last were the financial implications of an out of state move. There are the obvious costs, like moving supplies and a moving truck. But lots of other costs involved as well which you might not think of off the top of your head! In today's post, I'm sharing a list of financial obligations to be prepared to pay for with an out of state move. I'm also sharing a Q&A at the end with some general moving questions that a few of y'all DM'd me! *DMV expenses in new state - a lot of people try and keep their former license and plates for many months, but this is actually ILLEGAL in most cases! In every state that I've moved to, it's the LAW to establish residency with your vehicle within 30 days of the move. So far Vermont was the most expensive state that I've had to do this in- their registration and license costs were double that of NC. I was very lucky with my moves to Vermont and Virginia that my parents generously paid for the cost of renting a moving truck and the hotels that my dad and I stayed at overnight while moving. I had just finished school and didn't have much in savings before my Vermont move, and with my Virginia move... let's just say that my first salary in radio wasn't that much better than what I made working part-time as a student! So I am very grateful they helped out with some of the costs associated. However- as you can see from this list, the moving truck and hotel rooms aren't everything! There's a lot of costs involved with an out of state move. From moving supplies to a new apartment security deposit to DMV fees.... yikes yikes yikes. I've definitely had to cut back over the last couple months on personal purchases and "fun spending" to make sure I'm not overspending right now and still being financially responsible! *What did you use to move your bigger stuff? As I mentioned in Part 1 of this blog post series, my dad and I chose to rent a Penske truck for both moves this year and last! I'd highly recommend them! They seem to be the cheapest moving option by far, and they offer a Triple A discount as well. I talk more about that part of the moving process in this post. *Is it worth it to hire movers? I think it would be worth it to hire movers for moves of great distance, or to move a whole house. I've only ever moved one bedroom apartments, and I don't have a ton of large furniture. I can imagine with an entire house or condo an out of state move would be difficult. What my dad and I have done is hired local movers to load/unload the moving truck for an hour on moving day in each state- essentially just to carry in the heavy furniture. That's what works well for us! But if you'd be unable to drive a rented moving truck out of state yourself or find someone to do it, looking into movers might be smart. *What are some things you think are easy to forget your first time making that big of a move? Definitely how many financial obligations there are with moving!! Hence the inspiration for today's post. (There really should be a college class on adult things like this...) Also- make sure to prioritize saying your goodbyes to family/friends in your former state, and have a going away party if you can! I promise you'll regret it if you don't. *How do you make friends in a new city? I wrote an entire blog post on this topic while I lived in Vermont! Truth be told- new job has been keeping me so busy here in Virginia (and I already knew some acquaintances in Charlottesville as well) so I actually haven't tried most of these things here yet- but I need to make more of an effort with meeting friends soon! I will say- blogging has helped me so much with meeting people in North Carolina, Vermont, and now Virginia. I'm thankful for it! Calling all fellow makeup lovers! Sephora's biannual VIB Sale opened today to VIB members and Beauty Insider members of the Sephora rewards program. VIBs can save 15% on any purchases from now through April 23rd, and Beauty Insiders can save 10%. If you need to replace an empty product, or have been wanting to try something new from a high-end beauty brand, now is a great time to do it! Do you remember your first experience with Sephora? Mine was when I believe I was in 9th or 10th grade, when the first one opened in the Maine Mall (the mall where I'm from). I had heard about Sephora from magazines and online, so I was so excited to finally have one in my local mall! I remember that my first purchase there was a quad of turquoise eyeshadows. Hey- I've always like my bold and bright colors, even in makeup! A couple years later, Ulta also opened in Maine, and then my loyalty in makeup shopping kind of shifted. I know, I know... this is a Sephora focused blog post, but I'll admit it, I'm more of an Ulta girl! (Hence why I'm still just a Beauty Insider, and don't have VIB status!) But with that said, Sephora does sell a few things I love that Ulta doesn't, and I do still enjoy Sephora as well. I wanted to share some of my high-end beauty favorites in today's blog post in case you're looking for some new products to pick up during this edition of the VIB Sale! Happy shopping beauties! *IT Cosmetics Bye Bye Makeup 3-in-1 Makeup Cleansing Balm: I use a few different products to remove my makeup, but this is one of my holy grails since I first discovered it a couple years ago! It breaks down everything from facial makeup to the toughest waterproof eye makeup, and it will all rub off after applying into a tissue. I will say that this isn't the best to use on your eyes for days in a row if they're sensitive- I usually prefer to use a different makeup remover directly on my eyes specifically. But it works amazingly well to get off all types of makeup! It's pricy- so the VIB Sale is a great time to purchase! *IT Cosmetics Je Ne Sais Quoi Hydrating Color Awakening Lip Treatment: I've tried this product in both shades, and I love it! These are the ideal lipsticks for everyday wear or the workplace. I have the shade Rose in my workbag right now! I love them so much that I actually got more and gave them to some friends for Christmas last year since this is such a versatile lip product. *IT Cosmetics Superhero Mascara: Okay- one last amazing IT Cosmetics product! Overall I'm usually a fan of drugstore mascaras, but this one is a prime exception. It has incredible volume and length. I wear 2-3 mascaras daily, and this is usually my third mascara when I wear it, the icing on the cake for gorgeous lashes! The VIB Sale would be a great time to try it and bring it into your beauty routine. *Makeup Forever Ultra HD Foundation: This is my #1 Sephora specific holy grail item, as Ulta doesn't sell this! It is an expensive foundation, but so worth it. I am blessed to have very good skin (and I never suffered much from facial acne in high school), but despite that, I have always liked full coverage foundations for dressy looks and my photoshoots for the blog. This is my favorite foundation to wear for blog shoots. It blends effortlessly but definitely gives you a "made up with coverage" feel if that makes sense, but without feeling heavy! I can't recommend this enough, especially to other bloggers. It photographers very well too. *Too Faced Chocolate Gold Eyeshadow Palette: This was a belated Christmas gift to myself this year, and I love this palette! The packaging is adorable (I'm a sucker for that). I really like how it has a balance of gorgeous neutral shades as well as fun colors- best of both worlds! I still need to play with this palette more and see what other looks I can create. *Becca X Chrissy Teigen Glow Face Palette: One of my favorite beauty purchases of 2017! I adore each one of the four items in this face palette, and I've long ago hit pan on the bronzer in here. This was my very first Becca purchase and now I'm loyal to their highlighters and bronzers. If you haven't played with Becca makeup before, this palette is a great intro to the line! And it's perfect for travel. Plus cute packaging too! *Sephora Collection Face Mask: Sephora's own house brand has some great gems within the line. One day last summer I'd had a really long week and needed a little pick-me-up. I decided to try one of the face masks from the Sephora Collection, and it was just what I needed! So moisturizing and refreshing. I believe I tried the scent "Lotus." These are under $10 so you could stock up and save them for Christmas stocking stuffers or birthday gifts! There's just a few of my stand-out favorites for y'all! Happy makeup shopping this weekend, let me know if you pick up anything from the VIB Sale! My mom arrives in Charlottesville for a long weekend visit tonight! I will be taking Monday off from the blog to spend more time with her, but stay tuned for a new post on Tuesday! And of course you can keep up with me on Instagram @miss_alk this weekend- we have a fun weekend of adventures ahead. Shop Your Closet For Wedding Season: Part 2 - Showers + Rehearsals. It's time to talk wedding attire again! More specifically, how to restyle pieces from your own closet for weddings. 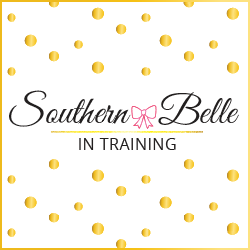 Today's post will focus on two more important pre-wedding events: bridal showers and rehearsal dinners. 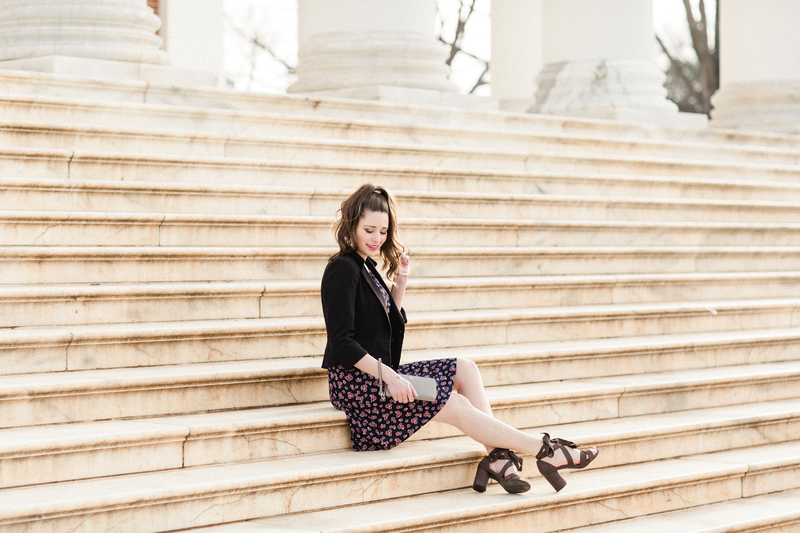 Unless each of these events has a specific theme or dress code specified on the invitation, it's a general rule of thumb to wear something nice and seasonally appropriate for the event, but not as nice of an outfit as you'll be wearing for the wedding. 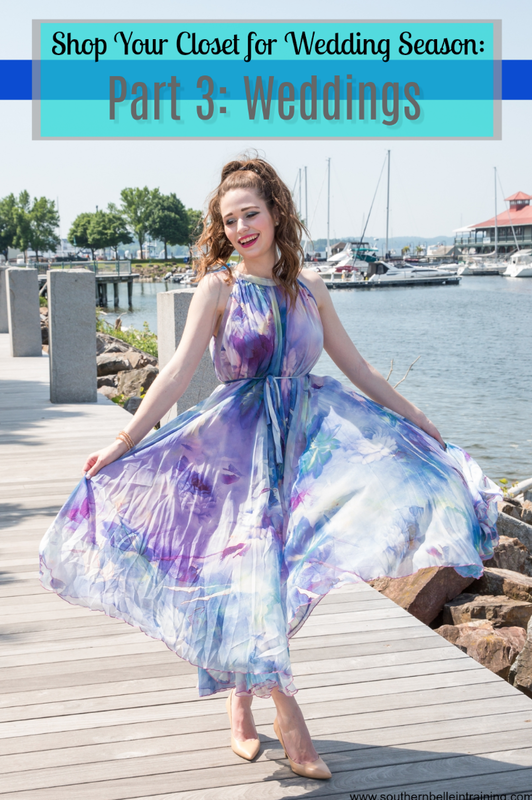 I'm personally a fan of really dressing up for weddings themselves, so events like showers and rehearsals are a great time to break out some of your more casual (but still classy) dresses and skirts, or even jumpsuits if you have them! I think that a midi skirt and coordinating top with heels could be such a fun option for a bridal shower! I love printed midi skirts, but sometimes it's hard to find occasions to wear outfits like this to. I would probably wear a different colored blouse than white if I wore this to a bridal shower (just since it's best to avoid wearing white if you're not the bride 😉), but I could definitely see myself re-styling this outfit for a wedding shower. Here's another skirt and top combo that I loved wearing on the blog that could easily be worn to a bridal shower!! The off the shoulder top paired with such a bold ruffled skirt makes for a really fun outfit. An all-pink outfit just screams "girly things" - and a bridal shower is super girly! A cute sundress in a summery color like bright yellow could be a darling choice for a summer bridal shower! 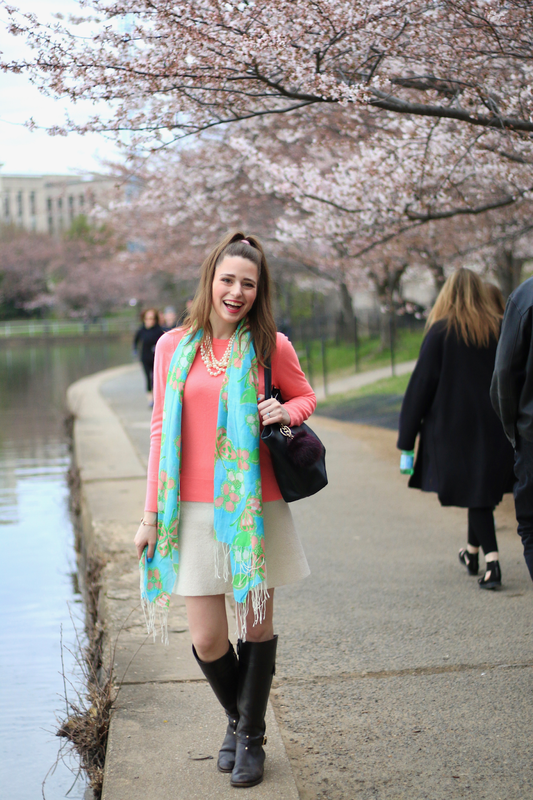 I styled this look with a turquoise clutch and earrings to add even more pops of color. This dress or one like it would definitely be too casual for a wedding, but could be a great option for a shower. You can NEVER go wrong with Lilly Pulitzer for wedding related festivities! Especially those in the springtime. I do find a lot of Lilly dresses to be on the casual side for weddings themselves, but many are perfect for bridal showers and rehearsals. This specific dress is actually still in stock! For holiday or winter wedding events, Lilly or bright colored dresses might not be the best choice. But you can still have fun with your outfits! 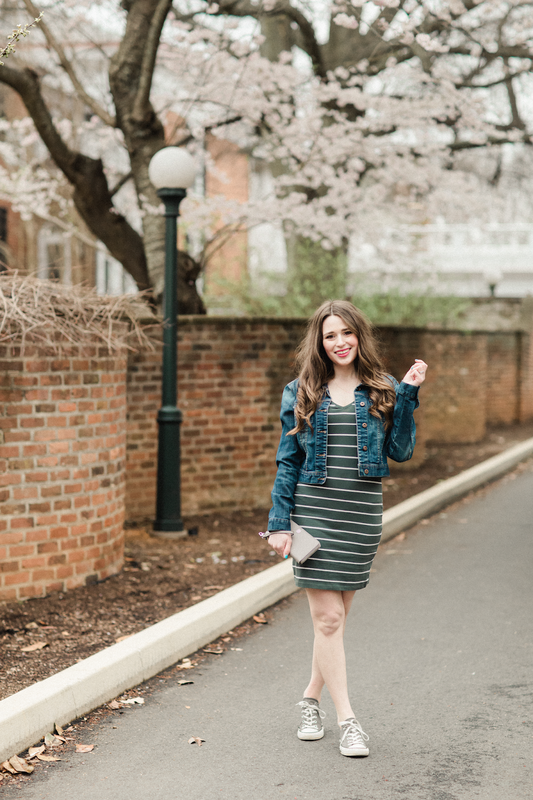 This look was from a holiday blog post that I did a couple years ago, but I think it would be a great outfit to wear to a winter bridal shower or rehearsal dinner as well. The polka dots and bell sleeves give this dress such a fun twist. A similar dress is available here! This was actually what I wore to a rehearsal dinner that I attended last spring! The dress is from one of my favorite fashion lines, CeCe. I added a coordinating cardigan to make it a bit more modest for the church portion of the wedding rehearsal, and then wore it as pictured for the dinner part of the evening. My dress is now sold out, but this one and this one from CeCe would be cute for this season! 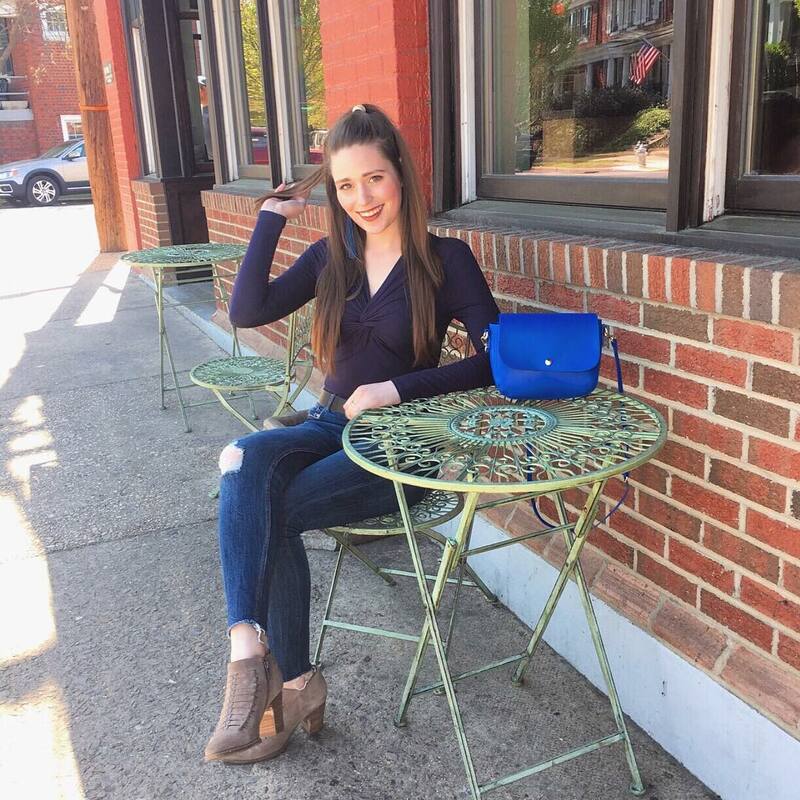 Be sure to check out the first post in this series if you haven't yet, it's all about shopping your closet for bachelorette party outfits. The final post, all about weddings, will be up soon! Hope that you're having a great end to your week! My mom is coming to visit me in Virginia this weekend- this will be her very first visit to Charlottesville! Neither of my parents had ever been to this part of the state before, and I came here solo on my job interview trip this winter. My mom is really excited to see where I moved to, and I think she will like it here a lot. Winery weekend: My 4th weekend in Virginia was another for the books. (Seriously... each weekend keeps getting better since I moved!) Alicia from Alicia Tenise was in town, and I spent my Saturday with Alicia, her boyfriend, and also got to meet some of their friends. We visited four different wineries, and I kind of fell in love with the Virginia wine scene! What a fun, fun weekend. 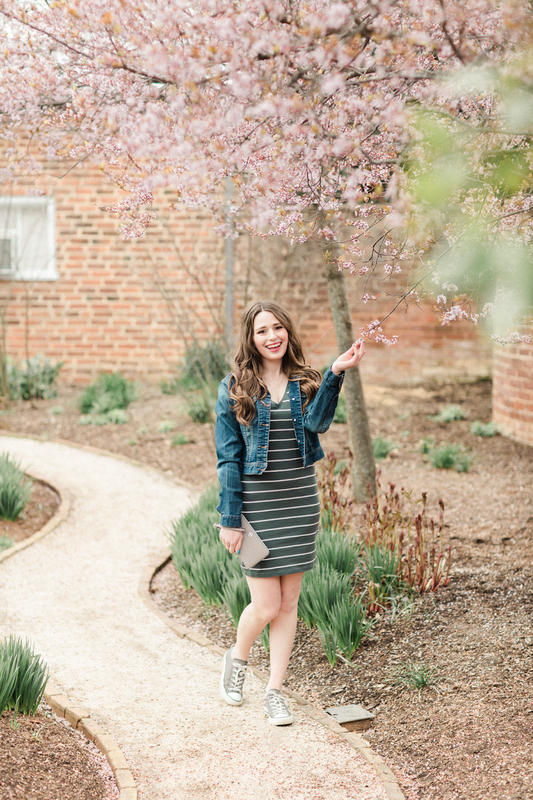 Charlottesville and the surrounding counties in Central Virginia are known for the beautiful wineries, and I can't wait to discover more of them this spring and summer, and in years to come! It was also so fun to finally get to hang out with Alicia after reading her blog for years now. #PigeonWatch2k18: If you watch my Instagram Stories, you will know that I have a new resident out on the deck of my apartment! A mama pigeon built her nest there over the weekend, and has laid two eggs in it. It is the cutest thing to watch mama bird protecting the eggs... I can't wait to see the baby birds soon! According to Google it takes about two and a half weeks for pigeon eggs to hatch- we'll see if that's accurate! New library card: Something exciting from last week was that I finally got my new library card!! I didn't really have time to read for fun during the last month with moving, so it was so fun to check out one of the new libraries here in Charlottesville and take a few books home with me. One of my goals for 2018 was to read 30 books so I have some catching up to do! I absolutely adore libraries- when I was growing up I was in book clubs at my local library back in Maine for several years! Purchases: No fun purchases this week (moving expenses are still hitting my credit card.... it is no joke financially to move out of state! ), but my mom is visiting this weekend and I'm already excited to do some shopping with her this weekend! Both to get things for my apartment and also things for me of course, haha! 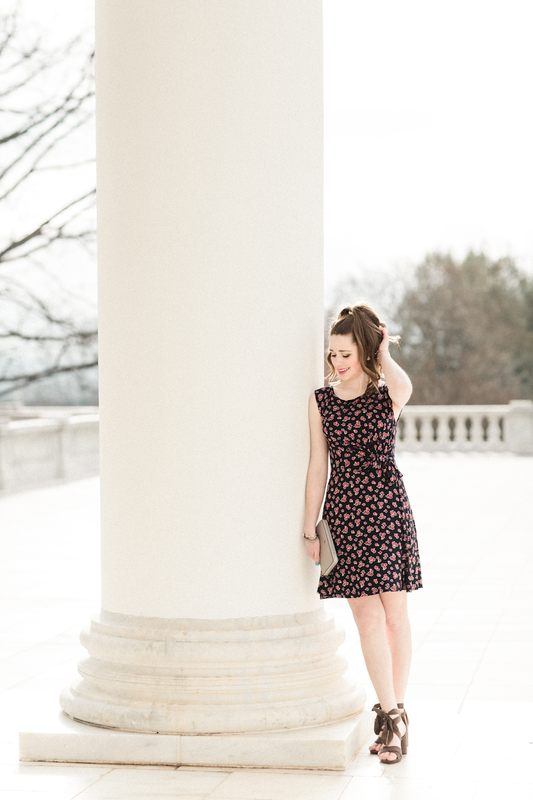 I saw this gorgeous romper featured on another blogger's Instagram last week and I am OBSESSED!! If I had an occasion or vacation to wear this to coming up soon I'd order this in a heartbeat. Such a cute pair of bedazzled sandals- a fun way to add some sparkle to everyday summer looks. Not surprising at all but Lilly's new arrivals have DONE IT AGAIN!!! This dress is everything! What a chic shirtdress!! As of the time I'm writing this blog post, it's on sale! Y'all know that I've been loving the Sugarfix by Baublebar jewelry at Target. These earrings just launched and they're so fun! Recipe of the week: Thai Peanut Chicken Noodles from Damn Delicious. I made these on Monday night and posted it to my Instagram Stories, and so many of you DM'd me for the recipe!! They were pretty good and I definitely think I'll try this recipe again. I didn't put any cabbage in (I'm not a big cabbage fan) and I also just used regular Stir Fry Rice Noodles from the Thai Kitchen brand instead of Yaki-Soba noodles as the recipe requested (the grocery store I went to didn't sell those), but those were the only changes I made! I think next time I'll try and find the correct noodle type though. Song of the week: What a Feeling by Irene Cara. Do y'all ever have a week where you hear a really old song and forget how good it is? I heard this song from Irene Cara on one of the Classic Hits stations here in Charlottesville last week, and forgot how fun of a song it is! Added it to a Spotify playlist and BOOM! On repeat for days- ha! Guide to Moving Out of State: Part 2 - Packing Tips! Happy Wednesday!! Thanks as always for reading. Welcome to the second post in my moving out of state series!! Today we're talking all things PACKING! Packing is one of the biggest parts about any type of move... whether you're moving down the street or across the country. It can also be the most overwhelming part of a move, and the most tedious. But when executed with a lot of preparation and planning, it can go much more smoothly than done at the last minute! The key with a large move is to buy your necessary packing supplies well in advance! I did a better job with this during my move from NC to VT. I'm emarrassed to let you know that with my recent move to Virginia, I kept running out of boxes up until MOVING DAY. Yikes! If I ever move again, I know I need to start shopping for supplies more in advance. Another thing to keep in mind is that it's always better to overestimate how many moving supplies you'll need (if you save your receipts you can always return unused supplies later!). That was my other issue with the recent move... I kept underestimating how much stuff I'd need and running out of boxes, packing tape, and other things. *LARGE moving boxes - bulky clothing (bathrobes, etc), shoes, artwork, decorations, holiday decor, kitchen supplies, bathroom stuff, linens, books, stuff for dining room, pretty much everything from apartment that doesn't have a specific packing method! *SMALL moving boxes - I save a lot of the boxes that I get from blogging PR packages, but you could also see if your workplace has any free small boxes if you don't want to buy these in small sizes. I use small boxes for packing certain specific areas of the apartment that I want to keep all together, such as a certain desk or kitchen drawer, my necklaces or bracelets, winter hats, etc. *Packing tape - Self explanatory! You can never have too much as it's not just for sealing boxes. I use this to add extra protection on plastic bins and other packing methods as well. *Bubble wrap - Some of it is for packaging your small fragile items, but mainly for protecting your furniture and large items going in the moving truck! You'll need LOTS of bubble wrap. *Stretch wrap - For sealing the bubble wrap on large furniture items! *Moving blankets - To help package extra fragile furniture like mirrors, bureaus, etc. *Post-It Notes / Paper - To LABEL EVERYTHING!!! The more you label, the easier unpacking is. I promise! So I bought my boxes this time around at Lowe's, Home Depot and U-Haul... I wanted to test out all types and determine which was the best place to buy them at. Here's the honest truth- after moving... I have no memory of which boxes from which store I put which items in, or which I liked the best! I can report that all the boxes, no matter the retailer, did their job well! I don't think there is that much of a difference between the stores. I will say that the "Heavy Duty" labeled moving boxes from Home Depot and Lowe's were especially sturdy and seemed worth the extra few cents if you're packing heavy items in them. One thing that I did like purchasing from the U-Haul store specifically were some boxes designed for packing dishware and glassware. They have sectioned off spots for each fragile item, and foam padding built in. I was worried about some of these items getting broken in the moving truck, but they were fine! One major key to successfully executing an out of state move is packing smart, and packing early! While you don't want to start packing too early (it would be weird to be living amongst boxes for 4 months before a move), starting to pack too last minute will just make everything more difficult. I've tried to break down packing into three phases- early (one month-two weeks out), prime time (two weeks-one week), and last minute (one week- moving day). There are obviously some essential things in your apartment or home that you'll have to keep out and use right up until moving day, but the more you can do earlier the better! This is also the time to PURGE anything that you don't need anymore or don't want to take with you to your new home! Think about it this way... the more stuff you take with you, the bigger the moving truck you need and the more packing supplies you need as well. Use this time to clean out your closet, and also any other parts of the apartment with things that you don't want or love anymore. Make trips to consignment shops, Goodwill, local charities that take donations, etc, or give to friends. I cleaned out so much of my wardrobe before moving to Virginia, and so far I have yet to miss anything I got rid of! *Storage related furniture like shoe racks, portable shelving, closet storage, etc. This is also a great time to put things into ottomans that have storage! Bedroom furniture is one of the last things that my dad and I pack, but also has one of the most important methods!! My bedroom furniture was a college graduation gift from my parents and other family members, and I want to keep it in the best condition possible for years to come. My dad and I bubble wrap each piece of furniture from top to bottom (and sometimes double bubble wrap extra fragile pieces like my mirrors! ), and then seal it with stretch wrap (you purchase this in large rolls at Home Depot or Lowe's.) Pictured above you can see what the headboard of my bed looked like using this packing method during this recent move! All of my furniture made it to Virginia with no damages using this packing method. Another thing that you can do on very fragile furniture pieces is make moving blankets the bottom layer, then bubble wrap, then stretch wrap. Now as far as unpacking... THAT is something this girl is not qualified to give any advice on, ha! Definitely not one of my strong suits. But packing itself I think I have picked up a few tips on with all of my college moves and the two out of state moves in 2017 and 2018, so I hope that what I've shared today might help you or someone you know with a large move in the future! Next week will be the last post in this moving series! I'm still debating what to do for the final post... send any ideas my way this week! And be sure to check out the first post if you haven't yet.